Well, how was your 2012? All-in-all, mine was pretty fantastic! My mom survived a medical scare, and this is what I am most grateful for, but other bright spots include the release of my two latest cookbooks, speaking at Camp Blogaway and BlogHer Food, and discovering that – after cleaning out 12 garbage bags of clothes and shoes – I CAN keep my closet organized! Who knew? In the spirit of ‘out with the old and in with the new’ I am also installing some nifty organizational shelves and drawers in my pantry. My 2013 goal is to keep my pantry neat and organized. Will I succeed? Only time will tell, but I am so much happier with a clean closet. A clean pantry can only serve to make me extra giddy. So, to celebrate the good things 2012 offered me, and to celebrate what I hope will be a wonderful 2013, I devised a little cocktail nibble perfect for a New Years Eve party! I rarely make homemade crackers and that is a real shame. Store bought crackers are easy, but they are never as good as homemade – which are really simple to make if we are being honest. 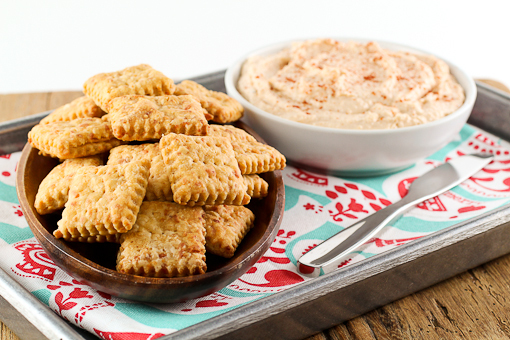 These little crackers are a cross between blitz puff pastry and a traditional spicy cheese straw with some beer tossed in for good measure. They bake up crisp, cheesy, and flaky and they are lovely all on their own. Of course, since this is me we are talking about, I could not leave well enough alone. 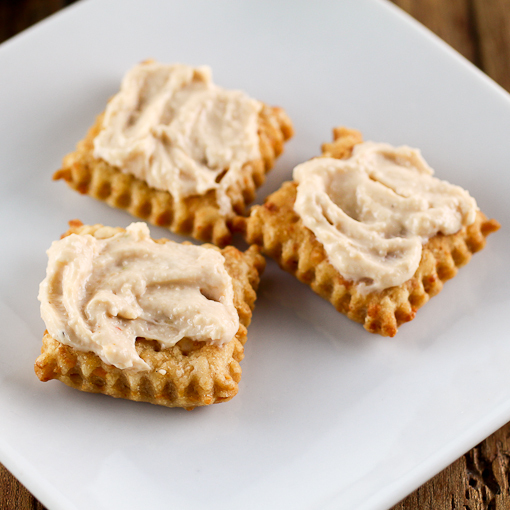 I whipped up a cheesy beer infused spread to slather over the crackers. 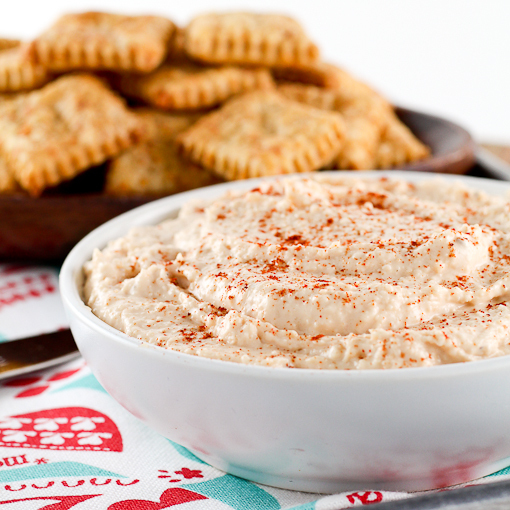 This dip could be baked and served warm, but I like it at room temperature. We served these cheese and crackers along with some champagne at Christmas and it was absolutely delightful! 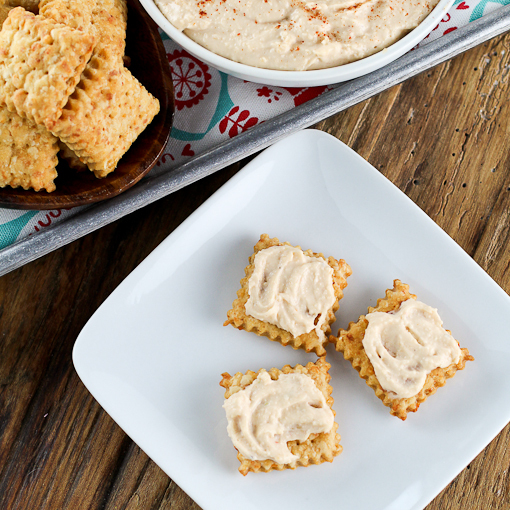 The bubbles in the champagne helped cut some of the richness of the cheese dip and crackers. So, for my final recipe of 2012 I give you these lovely little nibbles. I want to wish you a VERY happy and healthy New Year! See you in 2013 with more Shenanigans!! Begin by making the crackers. 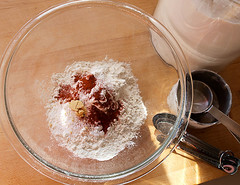 In a medium bowl combine the flour, baking soda, salt, sugar, paprika, mustard powder, and cayenne. 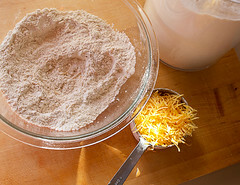 Whisk until well combined then add the shredded cheese and toss to coat thoroughly. 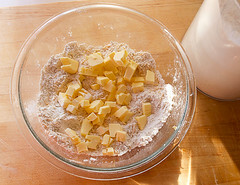 Add the cubed butter and, with your fingers, rub the butter into the flour mixture until it resembles coarse sand with a few pieces of pea sized butter remain. 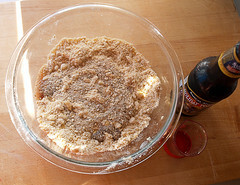 Add 3 tablespoons of the beer and mix until a shaggy ball forms and no dry flour remains on the bottom of the bowl. Add more beer, 1 tablespoon at a time, if it is not moist enough. Turn the dough out onto a lightly floured surface. Flatten the dough with your palm until it forms a rectangle that is roughly ½-inch thick. Fold the dough in half and repeat this process 4 more times. The dough should be smooth, if it is not fold it one more time. Wrap the dough in plastic and chill for at least 2 hours or overnight. 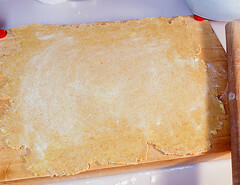 Heat the oven to 375 F and line two baking sheets with parchment paper. 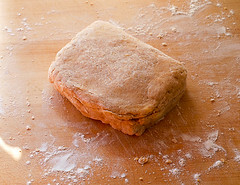 Remove the dough from the refrigerator and allow to stand for 10 minutes at room temperature. 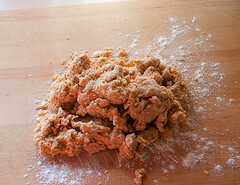 On a lightly floured surface roll out the dough until it forms a rectangle that is approximately ⅛-inch thick. Cut the dough into 1x1-inch squares using a pizza cutter or a fluted cutter. 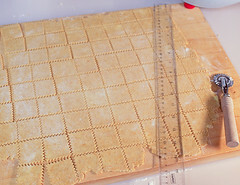 Place the crackers on the parchment lined baking sheets ¼-inch apart. Dock each cracker with a fork in a decorative way. (I just made three sets of holes, but I am not terribly creative!) 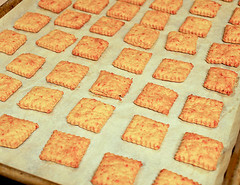 Bake for 10 to 12 minutes, or until the crackers are puffed, crisp, and golden brown. Cool to room temperature on the pan. Once the crackers are ready prepare the spread. 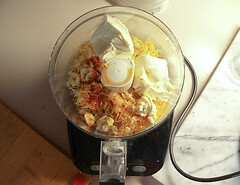 Place all the ingredients for the spread into the work bowl of a food processor except the salt and pepper. Process until the mixture is very smooth, about 2 minutes, pausing occasionally to scrape down the sides of the bowl. Season with the salt and pepper, if needed. 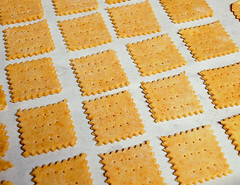 Chill the spread for at least 1 hour before serving. The dip can be made up to 2 days in advance if desired.